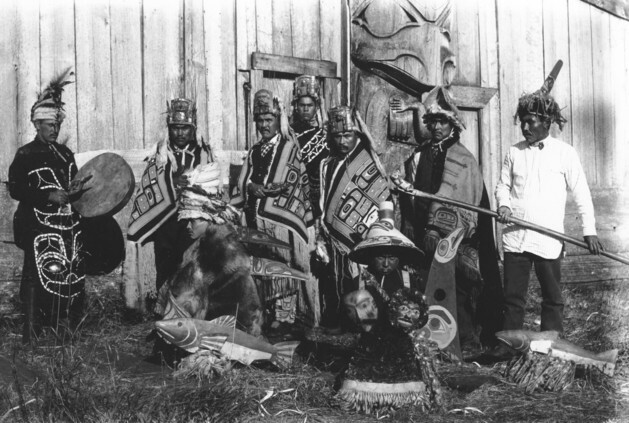 Men with regalia and crest objects stand in front of Edwin Scott’s Dogfish House at a 1901 potlatch at Klinkwan commemorating the move from Klinkwan to Hydaburg. Robert Edenshaw (left) wears a tunic with shell button design and holds a Raven rattle and drum. To his left, four men – unidentified, Eddie Scott, Donald Mikatla, Eddie Cojo – wear robes and headdresses with a carved frontlet, sea lion whiskers, and train of ermine pelts. Eddie Scott also holds a Raven rattle. Ben Duncan (front, center) wears a crest hat and displays a mask in each hand. Also pictured: Antkleg (Mike George; second from right), Nasank (Adam Spoon’s son; far right) and Matthew Collison (kneeling). Courtesy of the Alaska State Library, Winter and Pond Collection, ASL-P87-0316.